A lawnmower has been blamed for wrongly triggering sensors that predict when the Northern Lights will be visible in the UK. 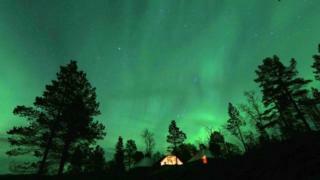 A red alert issued via the Aurora Watch mailing list was withdrawn after sensor readings were found to be “spurious”. An investigation revealed a lawnmower had got too close to one sensor, triggering a “massive spike” in data. Aurora Watch said it was looking into ways to avoid the incident being repeated. The bogus alert was issued during the afternoon of 23 August, after a magnetometer at the University of Lancaster recorded a surge in geomagnetic activity. Aurora Watch is run by scientists at the university and takes readings from lots of magnetometers to work out when the aurora borealis will be visible across Britain. The project draws on magnetometers in Lancaster, Aberdeen, the Faroe Islands and further field. The alert was withdrawn four hours after being released as it emerged only one sensor had recorded the spike in activity. A later update posted to the Aurora Watch webpage said an investigation had revealed that a groundskeeper using a “sit-on mower” to trim grass had been driving too close to the sensor, prompting the spike. “We’ll work with the facilities team to try and avoid an incident such as this occurring in the future,” said the scientists. They explained any metal placed on the instrument or machinery operating nearby could trick it into recording more activity than was actually present. Readings from the Lancaster sensor were not typically used to trigger alerts, they said, but problems with the main sensor in Aberdeen on 23 August meant it had become the lead monitor.